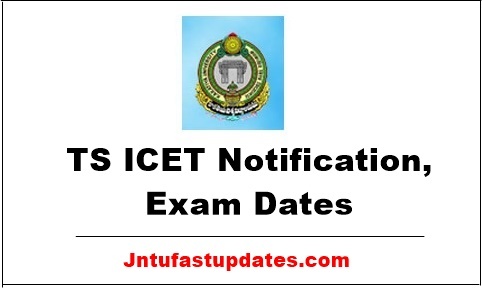 TS ICET 2019 Notification: Telangana ICET 2019 Apply Online Application form, Exam dates are available at icet.tsche.ac.in on 08th March 2019. Integrated Common Entrance Test-2019 (TSICET-2019) of Telangana State will be conducted for eligible applicants through ONLINE MODE by kakatiya University on behalf of Telangana State Conucil of Higher Education. For eligibility, syllabus, online mock tests, online submisssion of applications, the list of online examination centers and details instructions visit icet.tsche.ac.in. TSICET-2019 (Telangana State Integrated Common Entrance Test) is for admission into M.B.A. and M.C.A. courses of all the Universities in Telangana State and their affiliated colleges for the academic year 2019-20. This test is being conducted by Kakatiya University, Warangal on behalf of Telangana State Council of Higher Education, Hyderabad. Kakatiya University has successfully conducted ICET in 2005, 2006, 2012, 2013, 2014, 2015, 2016, 2017 and TSICET-2019. We welcome you to the web site of TSICET-2019 and wishing you all the best . తెలంగాణ రాష్ట్రంలోని ఎంబీఏ, ఎంసీఏలలో ప్రవేశాలకుగాను నిర్వహించే తెలంగాణ రాష్ట్ర ఐసెట్‌-2019 నోటిఫికేషన్ మార్చ్ 08న వెలువడింది. Applications are invited for appearing at the Telangana State Integrated Common Entrance Test (TSICET 2019) for admission into M.B.A. and M.C.A. courses (full time/part-time/evening/distance mode) offered by the following Universities in the State of Telangana including their affiliated colleges for the academic year 2019-2020 to be conducted by Kakatiya University, Warangal. a) The candidates should be Indian Nationals and should satisfy local/non-local status requirements laid down in the Telangana State Educational Institutions (Regulations of Admission) Order, 1974 as amended up to date (as per G.O. Ms. No. 25, dated: 19.03.2004 & G.O.Ms.No.108, dated 3-7-2005, Higher Education Department, dated 30-7-2005 and its amendments). i) For MBA: Should have passed recognized Bachelors Degree Examination of minimum three yearsduration except Oriental Languages. ii) For MCA: Should have passed recognized Bachelors Degree examination of minimum three years duration (except Oriental Languages) with Mathematics at 10+2 level. d) The qualifying Degree obtained by Distance Mode Program should have recognition by joint committee of UGC, AICTE and DEC/DEB. e) The candidates who are appearing for the final year degree examination shall also be eligible to appear for TSICET-2019. g) Qualifying marks in TSICET-2019 is 25% and no minimum marks are prescribed for SC/ST candidates. ii) applies in response to the admission notification issued by the authority concerned (for part-time\evening\distance mode). Submission of applications shall be mae through ONLINE MODE only from 07-03-2019 to 29-04-2019 (without late fee). The Registration fee may be paid at TSonline/APonline centers, and also through payment gateway (Credit/Debit card/Net banking). TSICET-2019 Applications should be submitted through ONLINE mode only. The Registration fee for online submission and late fee, if applicable, may be paid at APOnline /TSOnline Centers and also through payment gateway (Credit Card/Debit Card/ Net Banking). The TSICET-2019 examination will be held at the following 16 Regional Test Centers in Telangana State. i) This is only a Notification and not a prospectus. ii) For detailed information about instructions to candidates, syllabus and pattern of test, and Regional Centers etc., visit: www.tsicet.org, www.kakatiya.ac.in, tsche.cgg.gov.in. I join in college can give they fee return and certificates??? My exam 23rd afternoon 2 to4.30pm….which time I enter into examination center.. Please give me information…. I read that TS ICET 2017 applications are postponed. Is it true? Please tell me.